KDS Construction Ltd. Ranks No. 448 on the 2013 PROFIT 500, KDS Construction Ltd News. June 3, 2013 – PROFIT Magazine today ranked KDS Construction No 448 on the 25th annual PROFIT 500, the definitive ranking of Canada's Fastest-Growing Companies. 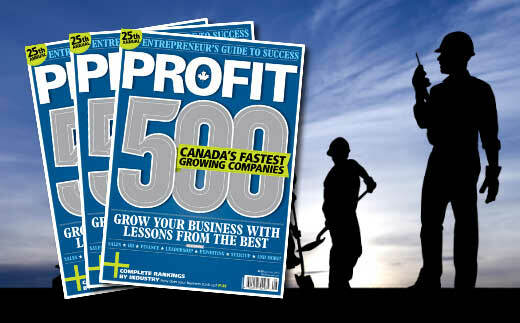 Published in the Summer Issue of PROFIT Magazine and online at PROFITguide.com, the PROFIT 500 ranks Canadian businesses by their revenue growth over five years. KDS Construction Ltd, a leader in General Contracting & Construction Management services in Metro Vancouver & the Fraser Valley, made the PROFIT 500 list with five-year revenue growth of 78%. "To celebrate the 25th anniversary of the Fastest-Growing Companies in Canada, the PROFIT 500 has expanded to recognize the entrepreneurial achievements of more than 500 Canadian companies," says Ian Portsmouth, Editor-in-Chief of PROFIT Magazine. "PROFIT is proud to now showcase Canada’s forward-thinking small business entrepreneurs and honour their talents and innovations." This honour comes shortly after KDS Construction Ltd. was recognized by Business In Vancouver magazine as being the 5th Fastest Growing Construction Company in British Columbia. President Kelly Shannon and Vice-President Marvin Kale are pleased to have been recognized by PROFIT Magazine and are determined to continue operating with the same professionalism, dedication and attention to detail that earned them this distinction. According to Vice-President Marvin Kale, "Our continued growth and success is a direct reflection of our quality staff and their commitment to delivering excellent results for our clients”. Incorporated in 1984, KDS Construction Ltd has been providing superior quality construction services for over 29 years. KDS serves the healthcare, commercial, institutional, food manufacturing and light industrial sectors in both renovations and new construction primarily in Vancouver, Metro Vancouver, the Fraser Valley and the Lower Mainland of British Columbia.